Even when I’m sure something is true, it’s always great to get verification. That happened recently with my Brennan family tree. How amazing to connect two families, separated by an ocean 180 years ago. My great great grandfather, Michael James Brennan, left Roscommon in 1833. He settled in Providence, RI. Tracing him back to Ireland seemed like a long shot. Meeting cousins seemed beyond the possible. Here’s the latest chapter of the story. Back in 2010, I first met my Brennan cousins at the family homestead in Roscommon. I had built on research done by my mother back in the 1970’s. She based her work on a hand drawn family tree made by her father, just before he died in 1947. I was able to identify the townland, Carrownamaddy, and was lucky enough to find them still living there. For the story of my 2010 trip, see Irish Family History Tour. Just before my trip in 2010, I noticed an ancestry.com message board post by Noel Masterson. Noel said he was researching Brennans from St. John’s Parish in Roscommon. I contacted him when I returned from my trip. I had no idea he was connected to the Brennans I just met. He was surprised and pleased to tell me I had met his uncles. What a connection! We assumed it would bear more fruit as we agreed to exchange our family trees and other Brennan related information. Noel had done quite a lot of research, so I would have to say I benefited more. But, he was happy to get my information as well. My siblings and I visited the Brennans in Roscommon several times over the years. They are always very welcoming. For the story of my 2012 visit, see A Cornucopia of Irish cousins … What a treasure to have this connection. Noel and I have stayed in touch, vowing someday to meet in person. Recently, I mentioned to Noel that it would be great to verify our connection using an autosomal DNA test at ancestry.com. He asked his mother if she was willing, and she was. Her test results supported what we “knew” to be true, that our mothers were 3rd cousins! It only took 180 years, but it was worth the wait. It took almost two years from the first DNA match email I received to reach a definitive connection between our Sweeney families. Alex O’Brien Feldman first emailed me in January of 2015 with an Ancestry.com autosomal DNA match. We quickly determined our Sweeneys lived in the same Providence neighborhood in the early 1900’s and went to the same church. Surely, they must have known each other, But were they related? Alex sent me copies of hand drawn family tree information from his grandmother, Esther Sweeney O’Brien. My ancestors and even my siblings were listed on the paper. Sure seemed like we were related, but there was nothing to confirm it. Was that just research information or did she know the families were connected? There we sat for about a year. I created a summary of four Sweeney lines in Leitrim in the late 1800’s. Two families in town and two up on the mountain. I assumed at least two of these lines were probably connected. But which ones? My Sweeneys were from Gubnaveagh on the mountain and Alex’s family was from Ballinamore. In April of 2016, things got more interesting when Alex contacted his Sweeney relative in Virginia in hopes of something more concrete. Then in October, we cracked the code! Alex’s relative had a letter from Alex’s grandmother about a Sweeney cousin in Narragansett. The letter named the cousin, Patrick Sweeney, and his son, Robert Sweeney. I knew they were also cousins of my family! At this point, the flood gates opened. I had photos from a Sweeney family party in Narragansett in 1976. Turns out the photos included Alex’s grandmother and her sister, Ethel Sweeney Moffit. My parents moved away from Providence just before I was born, so I asked a Providence cousin if they remembered either of these people at our grandparents when we were growing up. They didn’t, but they did know Joseph Sweeney and his wife, Peggy. They lived behind my grandparents. This was Esther’s brother! My cousins used to walk through the backyard to visit them. My cousins were young and unaware of the relationship. Alex and I plan to meet in Providence sometime soon. I doubt we ever met as children, but with all these connections anything is possible. With two of the four Sweeney lines now connected, I wonder if we’ll find out about the other two families at some point. There is always another mystery to tackle. My brother, Ted, and I made a trip to Ireland in May. We had fantastic visits with our McPherson and Brennan cousins, as well as our friends, the Clarkes. Gerry Clarke has been a great help in our family research over the years. We saw the old Sweeney (Leitrim), Horan (Sligo), and Brennan (Roscommon) cottages. 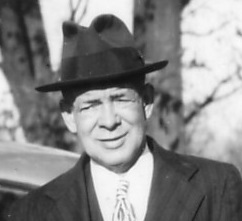 We found out more about our great uncle, Thomas Sweeney, through stories over tea at neighbors. We also had a nice visit with Michael Mohan, whose family bought the Sweeney property adjacent to theirs. It was another amazing visit. We spent a couple of days in Dublin before departing and I couldn’t resist a little more genealogy research. I found the death record of Thomas’ wife, Mary Agnes Foley, from 1963. She was the last Sweeney to occupy the cottage in Gubnaveagh. I was also able to trace back the first ancestors to live on the mountain in Gubnaveagh. I got a copy of the original deed from 1807 when the Gannons acquired the property. Terence Sweeny married Bridget Gannon in 1867. 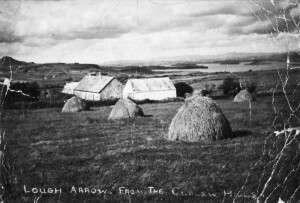 Soon after the marriage, the Gannons divided the property in two and the Sweeneys were entered into the land records. So, when did my Sweeneys arrive in Gubnaveagh? John Sweeney is listed on Terence’s marriage record as his father. John may have been born around 1810 and died in 1875. However, I can’t find his birth record. I have a possible marriage record. It is documented in local history that a group of people came down from Donegal to Leitrim around 1795. 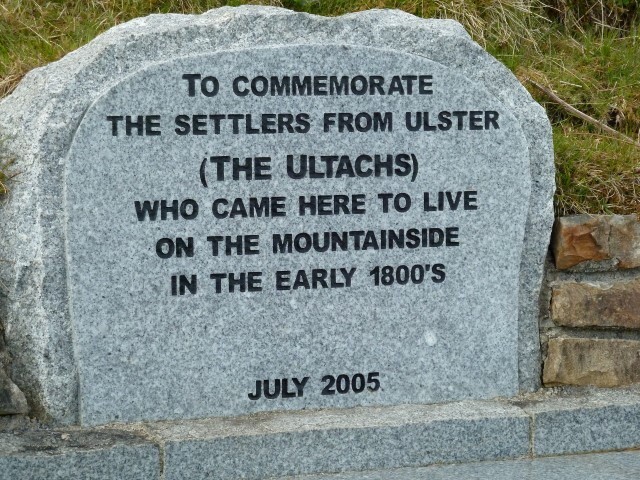 There is a monument to the Ultachs on the mountain. There were Sweeneys in the group, but I’m not sure if my Sweeneys were among them. Did John’s father come from Donegal in 1795 or did John arrive later on his own? I think I can only resolve this with the help of DNA testing. I have found four distinct Sweeney lines in the area, but can’t push any of them back far enough to see how they might be related or where they came from. I have a 111 marker Y-DNA test, an autosomal test, and the Big-Y. I’m looking for ideas as to how I can find out if any Sweeneys in Donegal share my DNA? Most of my Y-DNA matches are from much further back in Scotland. I am in the Sweeney DNA and Ulster DNA projects. I am now approaching another trip to Ireland, so it’s about time I posted a summary of our last trip. In July, 2015, we went on a family trip to Capetown, South Africa. It had nothing to do with my family history journey. The primary goal was to go somewhere interesting and check off another continent. Just Antarctica left to visit! It was a great trip. I would recommend it. We lucked out with fantastic weather in what normally would have been a cool, rainy period. We enjoyed the coast, the city, and ventured inland for some great sightseeing. The Cape of Good Hope, several wineries, an overnight at Inverdoorn Game Reserve, a cheetah sanctuary, and many more sights. Robben Island, where Nelson Mandela was imprisoned, was quite a moving experience. Climbing Table Mountain was a real adventure. We somehow picked a fairly challenging trail. We made it, but it wasn’t pretty. It was a steeper climb than I imagined. Being overdressed didn’t help. Next time, we will take the cable car. That’s the short version of a long trip. Now it’s time to focus on my daughter’s upcoming wedding and a subsequent trip to Ireland with two of my brothers. In July, we had another combination vacation and family history trip. Is there any other kind of vacation? This time, I was exploring my Gaetz roots in Nova Scotia. My ancestor, Johann Martin Gaetz, arrived in 1751 as part of a group of “Foreign Protestants” from Germany who were invited by the British to create settlements. My ancestors settled in Lunenburg, which is now a UNESCO World Heritage Site. 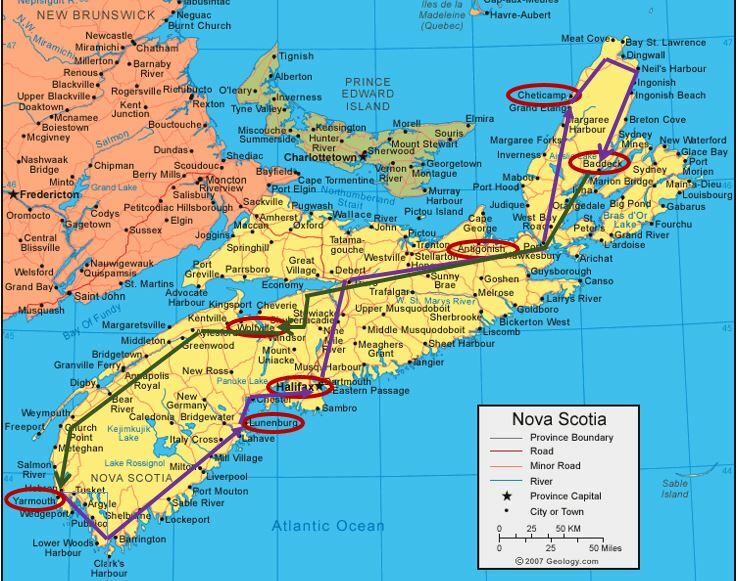 I had a family tree from my mother, her notes, and plenty of information from online sources, but I had never been to Nova Scotia. My grandmother, Florence Elizabeth Gaetz, came down from Seaforth, Nova Scotia to Providence, Rhode Island in 1918. My mother stayed in contact with a first cousin and his family. They visited each other several times over the years, but I never met the family. Prior to the trip, I was able to connect with a second cousin, Pat Gaetz. 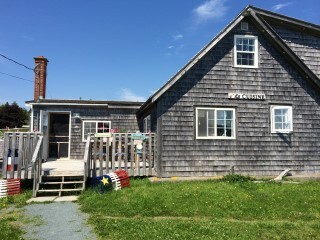 Pat, and her husband, gave us a wonderful tour of the family roots in the Halifax area. We were able to see the house where my grandmother lived, which solved the mystery of a framed photo on a wall at my parent’s house. None of my siblings knew what it was, but you don’t frame a random photo and hang it on the wall. What a great surprise when saw the house! I’ve written that on the back of the photo for future generations. Pat took us to eat at a very small, local restaurant called La Cuisine, in nearby Chezzetcook. As we were chatting with the owners, it turns out one was a Gaetz second cousin and the other married to a Gaetz! Our second great surprise of the day. To top it off, we saw the dessert menu highlighted gingerbread. We had wondered about the origin of my mother’s gingerbread. Sure enough, the gingerbread was very much like hers. Her love of molasses and gingerbread certainly came from the area. Three mysteries solved in one day! As for sightseeing around Nova Scotia, we thoroughly enjoyed our trip. We arrived in Yarmouth via the new Nova Star ferry from Portland. It was a “cruise” experience as opposed to just a ferry. I would recommend it. All the places we visited were great. I’ve highlighted our main stops on the map below. Nova Scotia was beautiful. The weather was great, except for the last day with a visit from hurricane/tropical storm Arthur. It made our ferry back to Maine a bit choppy the next day, but not too bad. It’s been about 18 months, so it’s about time I mentioned our vacation last July. We’ve never taken a vacation on a big cruise ship, so we decided to start with a river cruise. It was a great trip, covering five countries. The trip began in Prague and ended in Budapest. We added an extra day of sightseeing in Budapest. All the cities were beautiful. We had such a positive experience with Globus on our trip to Italy, we decided to go with Avalon Waterways, a Globus brand. It was a middle tier priced trip, with nice hotels on each end of the cruise. There were plenty of ways to spend less or more, but this seemed like the right balance of amenities and cost. The food on the boat was fantastic. The waters were calm, with land always in sight. It was a good choice for us. Each day there was a mix of organized excursions and free time. We had a complication with a labor strike by the lock workers. It cost us a couple of days on the river. Avalon did some quick re-planning and arranged hotels, meals, and changes to the excursions. It was a bit disappointing to lose time on the river, but the trip was still great. It would seem a little silly to complain about touring Europe in nice hotels. It was out of Avalon’s control and they made the best of it. I highly recommend a trip like this! 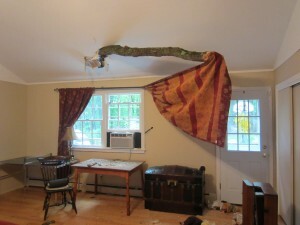 In late June, a 30 foot tree branch came crashing into our family room missing my wife by about 5 feet. The branch fell from about 70-80 feet and managed to drop straight down like a spear puncturing the roof and then settling back with about 20 feet outside and 10 feet inside. As it leaned back from the weight on the outside, it grabbed a curtain. It looked like a crazy curtain rod. Several people commented that it looked like modern art. All things considered, we were lucky. It happened on a weekday morning after the weather had cleared. Our carpenter and tree guy responded the same day. Our insurance company, AMICA, was very responsive. All parties did a great job from start to finish. Ironically, we recently had a branch removed from the tree because we were worried about it. It appears we removed the wrong branch! All is well now, but we considered it a warning and had the tree taken down. 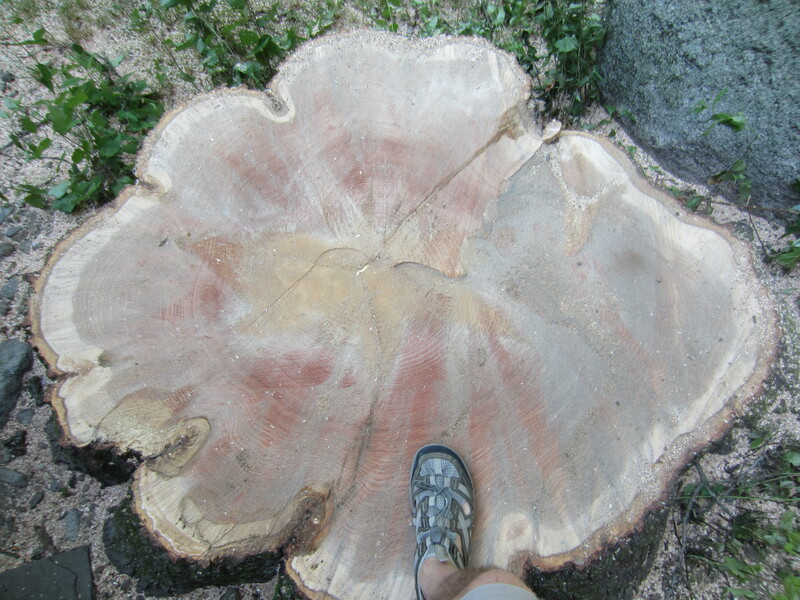 The stump is about 4 feet x 5 feet. I counted the rings and there are more than 100. Does that really represent the age of a tree? I hated to see that beautiful old tree go, but we couldn’t let it happen again and risk someone being hurt. Check out my flickr site for photos of the damage, repair and tree removal. In March, I was lucky enough to take another trip to Ireland. Scheduled to be in Dublin for work on a Monday, I decided to arrive on Saturday morning and head west for a weekend of visiting. My first stop was Ballinamore, county Leitrim. I had arranged to meet Gerry Clarke, a friend who has been a great source of local information over the past few years. This trip was an opportunity to make one more attempt to identify the gravesite of my grandfather’s family. His two brothers, parents and ancestors died in Gubnaveagh and were buried at St. Mary’s at Aughnasheelin. I’ve been over the church cemetery multiple times and since the last burial was around 1960, I assume the headstone is unreadable, buried or non-existent. We tried to talk to one of the neighbors adjacent to the old Sweeney property but we weren’t lucky enough to catch him unannounced – maybe next time. We did meet with the parish priest and found out there is no map of the plots from 50 years ago. Most people simply know where their families are buried. There are no civil burial records for any of the Sweeneys, so either they were vampires or they are indeed buried somewhere in the church cemetery. I drove to the Ballaghboy Lodge Farm in county Sligo very close to where my grandmother (Horan) lived. Gerry lives in the neighboring village of Ballinafad. We headed over to Boyle, county Roscommon, which is just a few miles away. I had met two 2nd cousins before in Boyle and was about to meet a third – John McPherson. His grandfather and my grandmother were siblings. John was a fantastic host, welcoming me as a family member albeit separated by distance and many years. We spent time with his family. Meeting his wife, daughter, two sons, a daughter-in-law and four grandchildren was a treat. I had been corresponding with them on facebook and email since my last visit when John was out of the country. It was nice to exchange stories about our families and hear about my grandmother’s family and the place she grew up. We also visited with his sister, Maureen, as well as another 2nd cousin, Mary. As we drove around Boyle, John showed me the sights including a plaque of Maureen O’Sullivan, a Boyle native. Chris O’Dowd is another of Boyle’s most famous citizens. By the time John dropped me back at the B&B, I was running on fumes. However, the B&B had a guest performer playing that evening – Donal O’Connor. I managed to stay awake long enough to enjoy his performance. 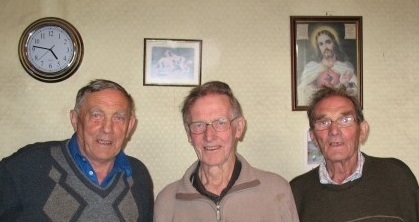 Sunday, it was on to Carrownamaddy, county Roscommon, for a short visit with the Brennans – Mick, Eamon and Vincent. On my last visit, my sister, brother and I met our Brennan cousins for the first time. I was treated to lunch, some nice conversation, and an introduction to their cows. We also called on another Brennan cousin as well as Liam Byrne from the local historical society. After signing the Brennan visitor book, it was back to Dublin to return my rental car and get ready for work on Monday morning. Viva Italia! A wonderful trip to Italy! Italy has been on my wife’s list of countries to visit for a few years now. We went there this past summer with some friends. The trip exceeded all our expectations. Since we had never been to Italy before, we decided to keep the stress level down and avoid driving. We took a Globus bus tour and I can’t say enough good things about the tour. Our tour director, Remo Beretta, was extraordinary and the other people on the tour were great travel companions. The tour covered far more ground in about 12 days then we could have on our own. We took hundreds of photos. I posted some of the highlights. I’ll be back with some personal reflections on the trip, but it has gone on so long I thought I would post the itinerary now. Maybe I can convince my wife to do a guest blog entry with some day by day impressions and highlights as she has been pouring through the photos to pick the best to capture our trip. … So much for the facts. I’ll follow this up with a personal summary soon – if you can use the word soon when 6 months have already passed. I have spent a lot of time tracing my Irish roots (Sweeney, Horan and Brennan). This culminated in a trip to Ireland where we met cousins and saw the old family cottages. Recently, I returned to researching my Gaetz line (my mother’s mother). Wow, there is so much information and so many people sharing their Gaetz family research. If you believe the records, the Gotz family was from Zurich in the 1500s and went to Palatinate, Germany by 1600. The name became Gaetz. Then in 1751 they came to Lunenburg, Nova Scotia along with 2000 “foreign protestants” who left Germany and other parts of Europe. In 1918, my grandmother Florence Gaetz came to the USA with her sister. On ancestry.com there are lots of people sharing their Gaetz family tree. Also, familysearch.org has an extensive number of Gaetz’s. All sources seem consistent which sounds like a good thing. However, I suppose there is also a risk that people are just reinforcing inaccurate data by passing it around. I’ll have to look more carefully at the real sources.